Lynetta Laumea-Edwards is ready to make her mark on this edition of the OFC Women's Nations Cup. Making the shift from mother hen to being one of the chicks is taking some adjustment for Lynetta Laumea-Edward. Having taken a break from international football to start her family, the past few years have seen Laumea-Edward take on the role of manager for several of Samoa’s youth squads. But this time she’s part of a Samoa playing squad looking to make a mark on the competition as the OFC Women’s Nations Cup gets underway in Koné this afternoon. “I feel very excited and honoured to be representing my country once again,” the 34-year-old said. And her teammates should feel honoured to have her playing alongside them. 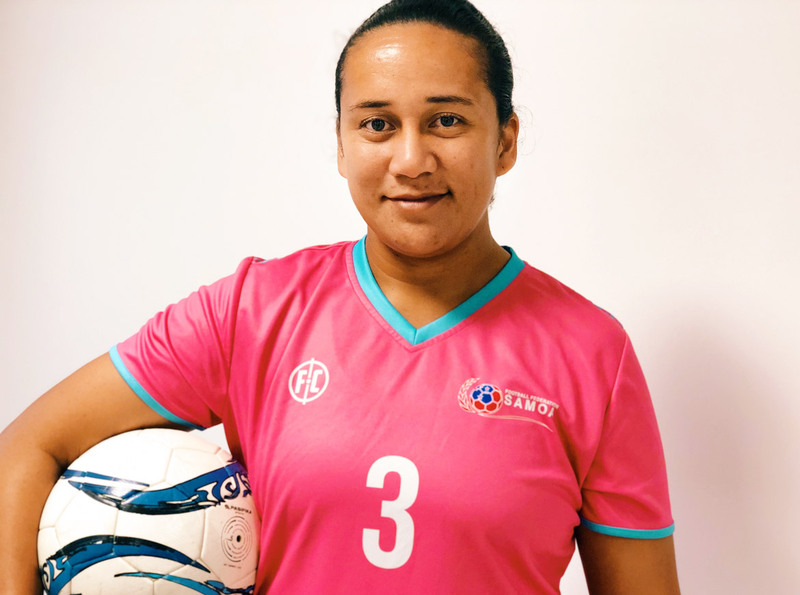 Laumea-Edwards holds the record of scoring Samoa’s first-ever senior women’s international goal when she netted a 77thminute strike against Cook Islands in 11thApril 2003. However, she’s not sure they’re aware a Samoan legend is walking among them, and she won’t be the one to tell them. Despite her modesty, Laumea-Edwards brings a wealth of experience in football, and as a leader, to this squad. She’s not taking her place in the team for granted though. “Of more than a thousand girls out there you get to be one of the those who are selected? I believe that’s God’s will, if you get the opportunity you are meant to be here, you’ve got a purpose for being here,” she explains. Now a mother of six, Laumea-Edwards is looking forward to her children seeing her represent their country, just as they have watched their father Desmond, a legend of Samoan football in his own right. “They’re so proud and they can’t wait to see me,” she beamed. “They’re good at keeping me in line when it comes to training and eating. They’re so excited and all my family has been incredibly supportive. Laumea-Edwards and Samoa will get their 2018 OFC Women’s Nations Cup campaign underway in the competition opener against Papua New Guinea at Stade Yoshida on Sunday 18 November from 2pm.